The last time I saw Bob Dylan perform live was at the Saddledome in Calgary on July 24, 2005, about four months before I became a father and pretty much stopped going to concerts with my wife. At the time I recall thinking that it wasn’t a great show. 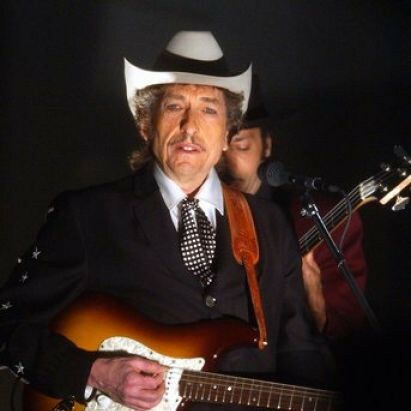 I was disappointed that Dylan no longer played guitar (piano and harmonica, but not much harmonica), and I thought that the sound was really rough. We had decided to go to the show partly because Willie Nelson was the opening act, and we figured that even if Dylan wasn’t good, Willie likely would be. Sadly, Nelson didn’t play the show, so that put everything off on the wrong foot with us. Also, the show itself was seen as something of a hostile act because it took place on the closing night of the Calgary Folk Festival, thereby drawing attention away from that event. It would have been better if it had taken place on Prince’s Island Park, to be frank. I just listened to a very good quality bootleg of this show, and I’ve found that it was far far better than I recalled it. A large part of this has to be the Saddledome. The Saddledome is an absolutely dreadful concert venue – one of the worst that I have ever been in. The acoustics are just terrible and there are only a few decent places to sit if you don’t get seats in the front rows (this review from the time also noted how bad the sound system was – it wasn’t just me complaining!). For the most part, it is important to sit directly straight back from the stage and never off to the sides where the sound bounces around. Unfortunately, we had seats to the left of the stage in the lower bowl and the sound was terrible. I remember thinking that “God Knows” sounded like a Sonic Youth-style wall of sound, but listening to it today I know that wasn’t the case – it is intense, sure, but not a wall of sound by any means. I wish it had sounded as good on that night as it does coming from the speakers of my laptop. Listening with fresh ears today, I found that the show itself was quite good. He opened with a lot of early material: “Maggie’s Farm”, “Tonight I’ll Be Staying Here With You”, “I’ll Be Your Baby Tonight” (I didn’t think much of this version), and “Lay, Lady, Lay” (two from Nashville Skyline! ), before moving forward in time to “God Knows” (which I think was the best song on the show), “Shooting Star”, and “Lonesome Day Blues”. When they moved into “Positively Fourth Street” Dylan spoke with the band, making me think, at the time, that it was unplanned. It was not a particularly strong version of this song, so that probably reinforced the idea, but I see that he played it in Vancouver a few nights earlier, so it probably wasn’t an audible. They definitely weren’t all in synch on this one, though, a few miscues on timing. “Watching the River Flow” was a nice version of that song, and so was “Highway 61 Revisited”. At the time I was a bit flummoxed by things like “Can’t Wait”, “Tryin’ to Get to Heaven” and “Summer Days” (played very similar to how it sounds on “Love and Theft”) because I hadn’t been keeping up with his recent work at all. I think that was the case with a lot of the crowd, many of whom were hoping for a more nostalgic show. The encore (which was quite delayed – I wasn’t sure he was actually coming back out) was fully nostalgic: “Don’t Think Twice” and “All Along the Watchtower”. I do remember that when we were walking through the parking lot we heard some 18 year old kid, with girlfriend, talking on his phone: “No, it sucked. He only did two big songs and he MASSACRED them! He sang All Along the Watchtower, but it was like All Along the…. WatchTOWerrrrrrrrr”. Poor kid. He got 8 songs (half the show) that are on one of the greatest hits collections, five recent(ish) ones and three from the depths of the catalogue. I call that a fan friendly show! But, yeah, no “Blowin’ in the Wind”, no “Like A Rolling Stone”, and everything else sounded totally different from the way it’s recorded. This was a short tour segment for Dylan. Four dates in Vancouver, one in Kelowna, Calgary, then three in Montana and off to Oregon. Sadly, every venue on the tour was probably better than this one, so I feel like we really missed out a bit. Dylan has come to Calgary twice since this show but I missed him both times – I may not have even wanted to go (both times were back to Saddledome, and that is a huge disincentive). I’ll be seeing him for the first time in a decade on Wednesday in Cleveland of all places, in what looks to be a great venue. This time, at least, I know the whole repertoire. I still don’t know what happened to Willie Nelson. Hmmm, I sense some passive aggressive intimations of causality here.